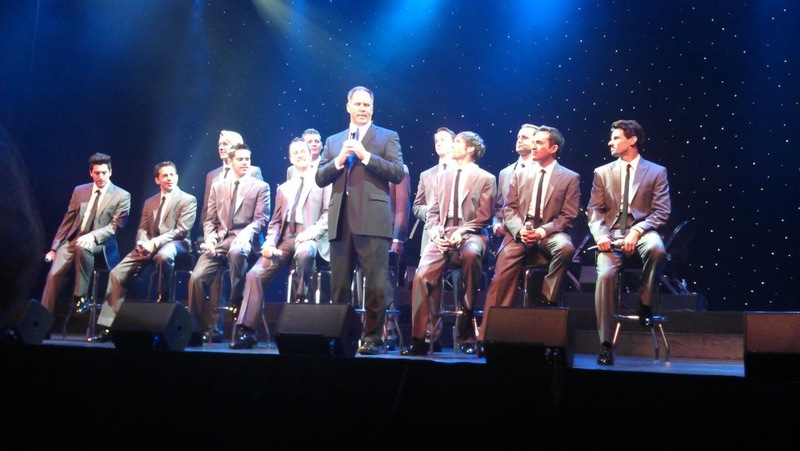 My dear friend, Herb (whom we lovingly rever to as “Opera Herb” because his mellifluous voice is something of a wonder), reports on the new, unique summer Chicago venue, The Riverfront Theatre, and its most recent production, “The Twelve Tenors.” Take it away, Herb! If you’re like me, you’ve commuted home north on the Kennedy, and have asked “What’s that blue and yellow tent over there by the river?” Your answer should be The Riverfront Theater at 650 W. Chicago. In it’s second year, Riverfront provides a summer/fall season packed with crowd favorites. If you’re like me and averse to traveling to Grant Park or Ravinia crowds on the lawn, this affordable venue might be just your ticket to summer fun. Partnering with the Chicago Tribune, they’ve opened a large temperature-controlled tent right on the Chicago River. While it does have the sense of being at Barnum and Bailey, simply calling it a tent seems to be a disservice. The large arena has done its best to make visitors feel welcome, from drink areas outside by the river, to a selection of more comfortable seats inside, apart from bleacher seating in the back. I, for one, hope they make a go of it. The experience feels quintessentially Chicago. I read a few grumblings online about it being difficult to get to. Don’t worry. There is easy parking in a garage on Larabee or Kinsbury, plus it’s walkable via El and bus. The main detraction within the space seems to be acoustics. As witnessed by various concertgoers straining to hear, and in one case cupping their ears, the venue should take heed to address concerns about the audience’s auditory experience. Either the bass and percussion carry too well in the acoustic, or the vocals were turned down entirely too low. Either way, I at times could not hear the singers or could not make out what they were singing. As for the headliner for the evening, The Twelve Tenors, well, let’s just say I am not the intended audience for this production. As a classically trained tenor, I default to rolling my eyes at groups such as this. But, I will say that the evening was enjoyable, even for this cynical audience member. Save for the unnecessarily prolonged introductions of the gents, the 12 well-coifed and dashing men sang through a number of standards that had the audience smiling and enjoying themselves. As a member of the Chicago classical vocalist scene, it was nice to see local representatives Branden James and Michael Brown in the mix. Chase Todd also sounded lovely in his “You Raise Me Up,” both in his performance and best rising to the occasion of terrible acoustics in the theater. For information on the latest productions at The Riverfront Theatre, go here. Previous Post Tonight: The Non-Equity Jeff Awards!